Although siderophores are generally viewed as biological iron uptake agents, recent evidence has shown that they may play significant roles in the biogeochemical cycling and biological uptake of other metals. One such siderophore that is produced by A. vinelandii is the triscatecholate protochelin. In this study, we probe the solution chemistry of protochelin and its complexes with environmentally relevant trace metals to better understand its effect on metal uptake and cycling. Protochelin exhibits low solubility below pH 7.5 and degrades gradually in solution. Electrochemical measurements of protochelin and metal–protochelin complexes reveal a ligand half-wave potential of 200 mV. The Fe(III)Proto3− complex exhibits a salicylate shift in coordination mode at circumneutral to acidic pH. Coordination of Mn(II) by protochelin above pH 8.0 promotes gradual air oxidation of the metal center to Mn(III), which accelerates at higher pH values. The Mn(III)Proto3− complex was found to have a stability constant of log β110 = 41.6. Structural parameters derived from spectroscopic measurements and quantum mechanical calculations provide insights into the stability of the Fe(III)Proto3−, Fe(III)H3Proto, and Mn(III)Proto3− complexes. Complexation of Co(II) by protochelin results in redox cycling of Co, accompanied by accelerated degradation of the ligand at all solution pH values. 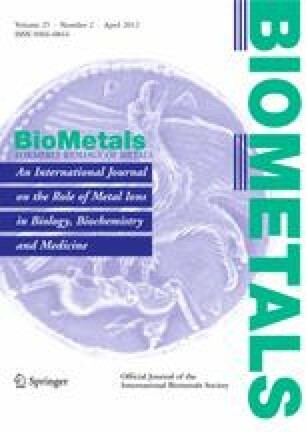 These results are discussed in terms of the role of catecholate siderophores in environmental trace metal cycling and intracellular metal release. The online version of this article (doi: 10.1007/s10534-011-9513-7) contains supplementary material, which is available to authorized users. We are grateful for support received from the National Science Foundation Geobiology and Low-Temperature Geochemistry Program (award number EAR-0921313). We thank Joe Rogers, Jasquelin Peña, Scott Calvin, and Martin Akafia for help during data collection at the synchrotron. We thank Dorothy Parker for valuable discussion. Portions of this research were carried out at the Stanford Synchrotron Radiation Lightsource, a Directorate of SLAC National Accelerator Laboratory and an Office of Science User Facility operated for the U.S. Department of Energy Office of Science by Stanford University. The SSRL Structural Molecular Biology Program is supported by the DOE Office of Biological and Environmental Research and by the National Institutes of Health, National Center for Research Resources, Biomedical Technology Program (P41RR001209), and the National Institute of General Medical Sciences. Mass spectra were obtained at the NCSU Department of Chemistry Mass Spectrometry Facility by Danielle Lehman. Funding for this facility was obtained from the North Carolina Biotechnology Center, and the NCSU Department of Chemistry.